In the spring of 1990 I graduated from a small state college in northern Vermont, Johnson State. All the friends I’d partied with for my first couple years had dropped out or transferred by then. One of them, a short blond burnout named Iggy, had in his brief drug-addled tenure occasionally referred to the college as Johnson Skate. The ceremony went on for a long time, several students from the graduation planning committee taking turns going on at length about their generic memories. It was in a tent and a light drizzle periodically drummed down on the canvas above our heads. I was hungover and starving. They draped some kind of sash over me when I went up to get my diploma, just as they had done for the others, and there was some tepid applause, as there was for everyone before and after me. A few days later I started working on the campus maintenance crew for the second straight summer. One of our first jobs was to take down the graduation tent. My plan was to save up money throughout the summer and use it for a plane ticket back to China, where I’d spent my second-to-last semester. I’d finally lost my virginity over there, a miracle that prompted me to wrench my feelings of gratitude and lust into something very much resembling love. I planned to go back and live with the virginity-unburdener, a college student named Li Hong. I even had a job lined up, teaching English at the university where I’d studied during my semester in Shanghai. This plan ended up falling through, and when it did I had no clue what to do with myself. I used my maintenance job money to travel to Europe for a couple months. I stayed in youth hostels, hitch-hiked some, took trains and buses when the hitching was too hard, ate gyros, beat off once in a while in bathroom stalls, went to many museums, sat around in churches a lot because you could just sit there as long as you wanted for free. Eventually my money ran thin and I started thinking about heading back. To what? I kept thinking. 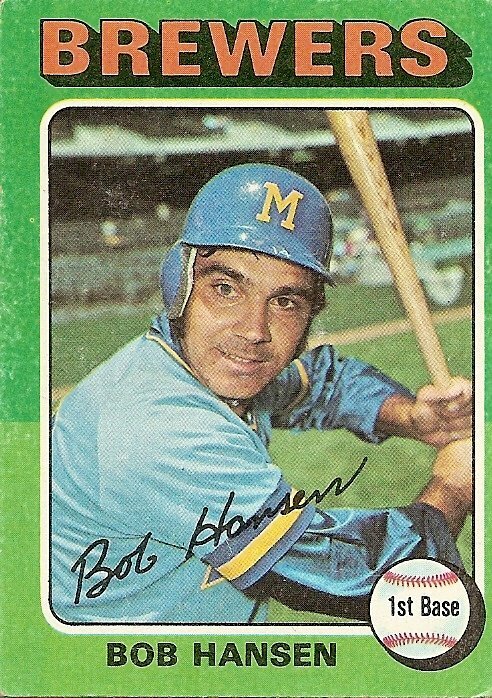 This is Bob Hansen’s only baseball card. After several years in the minors he had gotten the callup the season before, 1974, and had done well, hitting .295 and, as the back of the card puts it, “time and time again [coming] through with key pinch-hits in clutch situations for Brewers.” He didn’t get back to the big club again until 1976, his .164 average in just 61 at-bats prompting neither the Brewers to give him any further looks nor the Topps company to produce any more cards in his likeness. But at least he made the most of his one baseball card. Generally, players featured in the baseball card still-life of a batting stance convey either a wax museum lifelessness or a cringing uncertainty. On the other hand, the grizzled, faintly mirthful Hansen reminds me of Ernest Borgnine in the Wild Bunch, ready to follow William Holden into a hail of bullets. More specifically, he’s like Borgnine in that very last slim moment right before the climactic gun battle. Holden’s character, Pike, has just shot El Jefe, and now Pike, Dutch (Borgnine), and the Gorch brothers (Ben Johnson and the incomparable Warren Oates) are about to face off against hundreds of El Jefe’s men. They are doomed. But the last sound you hear before the bullets start tearing into flesh is Borgnine’s giggle. 1. And in an mmm-bop it’s gone. 2. Eerie. Borgnine was also the first thing I thought of when I saw the card. It must be the eyebrows. In any case, Bob Hansen looks like exactly the guy your mother was talking about when she told you never to get into a car with a stranger. The card is also unusual in that his sweaty, disheveled look is unlike other card photos, which normally look as if the player has been lazily idling around on a spring morning in Florida (which, in fact, he usually had been). 3. To these eyes he looks a lot like Dan Hedaya. 4. Eric! How’s it going? I used to post at Primer as GGC. When I was in HS, I used to watch Borgnine and Jan-Michael Vincent in Airwolf all the time. Didn’t VIncent later show up in Buffalo ’66? 5. Bob Hansen is the inspiration for the Tony Micelli character. The character of Tony Micelli was a former second baseman for the St. Louis Cardinals, which seems to absolve Bob Hansen of blame for indirectly helping cause the creation of one of the worst television shows ever. Ernest Borgnine was once married to Ethel Merman for a month. 8. Wild Bunch. Granddaddy of the super violence movies. Opening scene, overlooked. Kids torment a sandcrab. Pretty Lord of the Flies. Borgy was also in Marty, Dirty Dozen, and McHales Navy. You guys sell him short. He wasn’t what he looked like. Surprised by the similarity of our experiences, coming of age and flick watching, despite being a kid of the 60’s to your 90’s. Like Tony said last week after his Castenada moment, I got it now. Hansen probably feels the same way today, having played in the bigs and been featured on this sight. 9. 8: And don’t forget the Poseiden Adventure. Borgnine was the man. 10. Borgnine is also in a painfully awful yet hysterical (from a bad movie standpoint) flick entitled “Everyone Loves Mel” about a kid and a giant sea turtle. How you go from Bandito/bank robber to “sea turtle guy” I’ll never know. Ah- Wilker, I see we have another thing in common…..a penchant for Chinese women! 11. It has been a long time since I have seen satin sleeves underneath jerseys. Bobby was in school with me. Seems cool to me that he had a card!